Halo 2 Classic - MCC (by AKHUGHES90) Gamepack for Titan One. 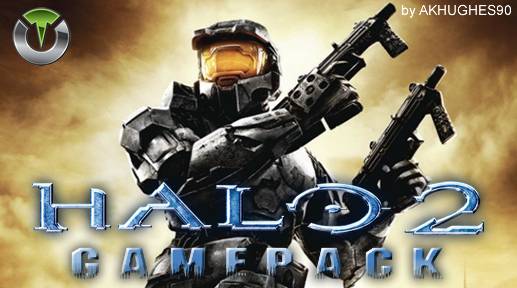 You can customize the Halo 2 Classic - MCC (by AKHUGHES90) Gamepack using the Gtuner's Gamepack Configuration Interface, by clicking on the slot number associated to the Gamepack. 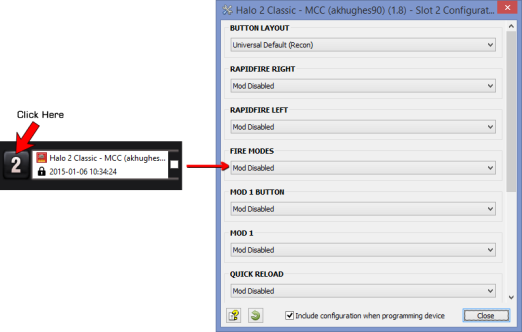 The Halo 2 Classic - MCC (by AKHUGHES90) Gamepack can NOT be configured using the controller. When rapid fire right is enabled, you can turn virtually any primary weapon into a fully automatic weapon. This creates a very unique advantage for players using semi automatic weapons. While rapid fire will not usually make a fully automatic gun shoot any faster, it can have positive side effects on fully automatic guns such as reducing recoil, helping players conserve ammunition and achieve more headshots. You can quickly toggle on/off or to Five Shot in game with D-Pad UP + Y. When rapid left right is enabled, you can turn virtually any secondary weapon into a fully automatic weapon. This creates a very unique advantage for players using semi automatic weapons. While rapid fire will not usually make a fully automatic gun shoot any faster, it can have positive side effects on fully automatic guns such as reducing recoil, helping players conserve ammunition and achieve more headshots. You can quickly toggle this on/off in game with D-Pad UP + Secondary Fire Button. Fire mode determines an alternative action to be used when rapidfire is toggled off. You can quickly toggle this on/off in game with D-Pad UP + Fire Button. With Battle Rifle and a Secondary weapon equipped, this MOD will execute a Five Shot Burst in a extremely fast sequence. With Battle Rifle and a Secondary weapon equipped, this MOD will execute the double shot in a extremely fast sequence. Quickly Doubleshot (Battle Rifle) with no secondary weapon. Choose what button activates MOD 1. Double Shot is a glitch in Halo that allows the players to fire two consecutive bursts from a Battle Rifle 5 Bullets or 6. Flag Carry is a MOD that picks up and drops a Flag/Bomb (to run faster) by simply holding a button. You can quickly toggle between the two MODs (Flag Carry) in game with D-Pad UP + Alternative Fire Button. Quickly BXR with/without a full clip. Enables the Crouch Melee Double Shot BXRRX combo. Enables the Melee Shot BXR combo. Enables the Double Melee BXB combo. Enables the Double Melee Shot BXR combo. Quick Reload is a button combo that allows a player to quickly reload their weapons. After a certain time in a reload animation, the weapons is reloaded. However, this combo allows players to cancel the reload animation and immediately fire their weapon again. A quick press runs the MODwhere holding the button performs a normal reload. The Melee Action combo extend the damage of the melee action. Enables the Crouch Melee Double Melee BXB combo. Choose what button activates MOD 2. Cannot be the same as MOD 1 Button. Double Melee Shot BXR combo. Holding the JUMP Button for more than 300 milli-seconds makes you jump and repeatedly crouch to be harder to shoot at. Tapping JUMP again stops Ghandi Jump.